"As Agile methods have entered the mainstream, we've learned a lot about how the testing discipline fits into Agile projects. 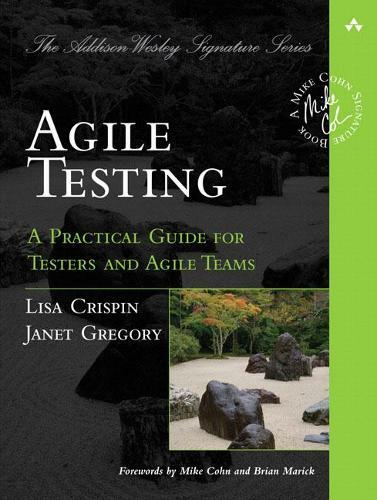 Lisa and Janet give us a solid look at what to do, and what to avoid, in Agile testing." "An excellent introduction to agile and how it affects the software test community!" "In sports and music, people know the importance of practicing technique until it becomes a part of the way they do things. This book is about some of the most fundamental techniques in software development-how to build quality into code-techniques that should become second nature to every development team. The book provides both broad and in-depth coverage of how to move testing to the front of the development process, along with a liberal sprinkling of real-life examples that bring the book to life." "Refreshingly pragmatic. Chock-full of wisdom. Absent of dogma. This book is a gamechanger. Every software professional should read it." -Uncle Bob Martin, Object Mentor, Inc.
"With Agile Testing, Lisa and Janet have used their holistic sensibility of testing to describe a culture shift for testers and teams willing to elevate their test effectiveness. The combination of real-life project experiences and specific techniques provide an excellent way to learn and adapt to continually changing project needs." "On Agile projects, everyone seems to ask, `But, what about testing?' Is it the development team's responsibility entirely, the testing team, or a collaborative effort between developers and testers? Or, `How much testing should we automate?' Lisa and Janet have written a book that finally answers these types of questions and more! Whether you're a tester, developer, or manager, you'll learn many great examples and stories from the real-world work experiences they've shared in this excellent book." "Finally a book for testers on Agile teams that acknowledges there is not just one right way! Agile Testing provides comprehensive coverage of the issues testers face when they move to Agile: from tools and metrics to roles and process. Illustrated with numerous stories and examples from many contributors, it gives a clear picture of what successful Agile testers are doing today."